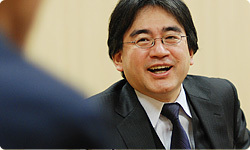 Today - for the first time in a session of "Iwata Asks" - I will be talking to a group of people who are all older than I am. I have gathered together developers who were at the forefront of Game & Watch, Nintendo's first handheld gaming system, which laid the foundation for the Game Boy and Nintendo DS systems. Thank you for coming today. First, I'd like you to tell me what you were in charge of for the Game & Watch system. Kano-san, would you start us off, please? You were part of the first generation back when Nintendo first started hiring people who specialised in design. Right. When development of Game & Watch began, I was in what we then called the Creative Section. Miyamoto-san was also once in that section. How many people were in it at that time? Five, including me. Research and Development Department I was going to make Game & Watch, but it didn't have a designer, so I participated as a helper. I did all-round design work - design aspects of the games, the faceplate around the LCD, the colour of the system, the packaging, and so on. You were involved with every aspect of design, from the character known as Mr. Game & Watch to the exterior box. Yes. I was a sort of jack-of-all-trades. But back then everyone was. Izushi-san, what did you work on? I worked on the software that made the game run. I did that together with Yamamoto-san. We took turns programming the software. And like Kano-san said, we were jacks-of-all-trades, so we also participated in meetings for new game ideas. We proposed our own ideas and had quite a lively time as we worked. Back then, the work wasn't clearly divided up among programmers, planners and hardware developers. Yeah, we did some of that, too. In the end, we'd even make arrangements for mass production. That's right, we did! I remember showing up at the location of the shoot, and even though it was afternoon, all the staff members said, "Good morning!" I thought that was weird. Editor's note: In Japanese video production circles people greet each other by saying "Good morning," regardless of time of day. It was our role to hide under a big box and play the game. Yes. We hid under a box and played the game, which was connected by a cable. The top of the box was lit up and a Game & Watch system was there, so it looked like the celebrity star of the commercial was playing it. The shoot lasted a long time. I remember how everything seemed so bright when I came out of the box! It was quite a valuable experience, though. I remember the Multi Screen1 advertisement pretty well. 1Multi Screen: A series of Game & Watch systems that featured two screens and a clamshell body. The first game in the series was Oil Panic , which appeared in Japan in May 1982. (singing together) Multi...la la la...Multi...! We were listening to it the whole time we were under the box, so I remember it well! What year did each of you join the company? I was the first, in 1972. Nintendo only had one development section then, so I was immediately assigned to the Research and Development Department. How many people were in that department? I think about 20. I designed board games and small analogue games. In 1972, you were designing board games without any advanced technology. 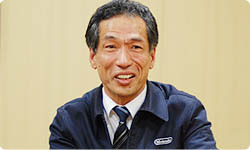 When did you come to Nintendo, Izushi-san? In 1975. I also belonged to Research and Development at first. I made targets for the Kousenju Custom2 series. If you hit the target on a doll, it would fall over. 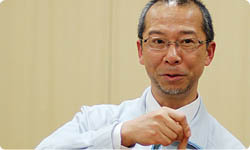 Kano-san was the one who designed the dolls. 2Kousenju Custom: An electronic light gun toy that employed a sensor with a resistance value that would change according to the amount of light that struck it. Two games were released in Japan in 1976: Kousenju Custom Gunman and Kousenju Custom Lion. Kousenju Custom Gunman and Kousenju Custom Lion. I became involved with the mechanical aspects, and, again, did everything from designing the chassis to working on the packaging and throwing around ideas that I thought would be neat. Later, I started working on video games. Back then, though, you couldn't change the games. You mean Color TV Game 6 and Color TV Game 15 .3 3Colour TV Game 6 and Colour TV Game 15: Released in Japan in 1977. The systems held, respectively, 6 and 15 games such as tennis or table tennis. Yes. Later on, I designed hardware for Color TV Racing 112 4 and Color TV Game Block Breaker .5 4Colour TV Racing 112: A video game system with a steering wheel and gear shift. Released in Japan in 1978. 5Colour TV Game Block Breaker: A video game system with six similar games based around breaking blocks. Shigeru Miyamoto was in charge of console design. Released in Japan in 1979. 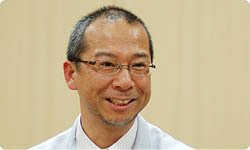 Yamamoto-san, how many years after Izushi-san did you join? Three years later, in 1978. 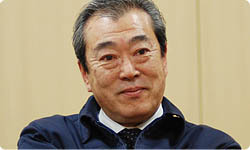 Soon after joining, I was assigned to the manufacturing department at the Uji plant for orientation. I helped with the manufacture of arcade games there, and then the next year I transferred to Research and Development II. When you joined the company, the Research and Development Department had been split into two separate departments. Right. When I transferred, development of Color TV Game Block Breaker was over, so we were discussing what to make next and making test models for new games. I was designing, by hand, the necessary mask pattern for making the LSI for production. Editor's Note: LSI stands for "Large Scale Integration" and refers to the type of circuitry used in an electronic game. Back then, game systems didn't use a computer, so instead of writing programs, you achieved the game through hardware. Hardware technicians made the games. You made a piece of hardware dedicated to a single game. If a hardware guy wanted to increase the speed somewhere, he'd bring in a soldering iron and change the wiring. We'd all play it and say, "Hmm, it needs to be a little faster," and then make repeated adjustments. Finally, we'd say, "Let's go with this!" and move on to mass production.